Technics SL-1200GAE turntable sells out in 30 minutes | What Hi-Fi? The hype around the new Technics SL-1200 turntable has reached fever pitch, with the first 300 models of the limited edition SL-1200GAE selling out in a matter of minutes in Japan. Two new Technics 1210 turntables are on the way this year, with the SL-1200GAE limited to 1200 units, while the SL-1200G will follow later in the year with a bigger production run. The first 300 units of the limited edition 'GAE model went on sale in Japan today priced at 356,400 yen (around $3300, £2200) and all 300 were bought within 30 minutes, according to Panasonic. 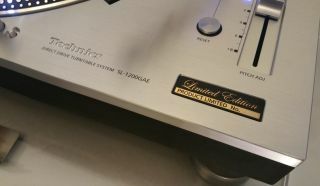 A further 900 SL-1200GAE turntables will go on sale worldwide, with the UK price confirmed at £2799. A Panasonic representative spoke to Japanese outlet Sankei Shuibum, saying: "I didn’t think the price was too high as we have confidence in our brand, but I didn’t expect them to sell out so quickly." The new Technics turntables were unveiled at CES at the start of the year, with the price tag taking many fans by surprise. Technics told What Hi-Fi? why the new turntable is so expensive at the Bristol Sound & Vision Show, and hinted that a cheaper model could yet follow.